1. The “butterfly effect” and working as an educator (2011) — A commentary on the role of teachers in people’s lives, inspired by Stephen King’s bestselling novel, 11/22/63. 2. Working as an educator: Parker Palmer’s The Courage to Teach (2011) — A few words about a great book for anyone who teaches. Also, here’s a short op-ed piece I wrote back in 2004 for the Boston Globe, “Note of Understanding,” that describes how my experiences in an adult education singing class (which I’m still taking!) have informed my approach to teaching. Does the term “collateral damage” help us to understand how some organizations treat workplace bullying? “Collateral damage,” according to the Merriam-Webster online dictionary, is an “injury inflicted on something other than an intended target,” especially “civilian casualties of a military operation.” It’s also a term that helps us to rationalize the suffering of noncombatant civilians as the inevitable (and thus vaguely justifiable) costs of war. Though most commonly used in a military context, the term resonates with my understanding of how some organizations regard the mistreatment of employees, especially bullying, harassment, and discrimination. No organization, explicitly or implicitly, considers bullying and abuse of workers as its main objective. (Okay, a few seem to come close…) Rather, in identifying organizational priorities, we’re more likely to hear about productivity, competition, innovation, and profit. However, when bullying or other forms of mistreatment occur, bad organizations often regard the targets of such behaviors as collateral damage. Hey, bad stuff happens in the rough and tumble world of work, and occasionally some really bad stuff happens — that is, to others. Organizational leaders assume that everything is going well, except for this distracting problem. In lousy workplaces, a target who complains about wrongful treatment — perhaps someone who previously was regarded as a solid or even outstanding performer — suddenly becomes the expendable other. This especially is so if the aggressor is a popular and/or powerful member of the management team. Once the target is pushed out, the whole incident is treated as an unfortunate and regrettable annoyance. What a shame, it just didn’t work out because of a personality conflict. The main business of being productive, competitive, innovative, and profitable may now go on as if nothing had happened. Apparently many others associate collateral damage with workplace bullying. Do a Google search using the terms together, and you’ll see what I mean. 1. Business Week on “Taming the Workplace Bully” — Adam Piore’s article examines the topic from a business standpoint — it’s even filed under the heading of “Competition” on the magazine’s website — and closes with an anecdote about a bullying target befriending her aggressor. Still, it covers a lot of ground and presents a variety of perspectives, including the legal aspects on which Gary Namie and I were interviewed. For decades researchers have used questionnaires known as Machiavellianism (or Mach) scales to measure an individual’s capacity to engage in the manipulative, amoral, and deceitful behaviors espoused by the 15th century ends-justify-the-means diplomat. Recently psychologists found that those who score high on the 100-point Mach scale are also among those likeliest to engage in office bullying. The problem of our time is that the emperor has no clothes, that we, humankind, are the emperor, and that almost nobody dared, until recently, to admit to our nakedness. It needed an economic meltdown to expose this nakedness in shocking ways. Former Federal Reserve chairman Alan Greenspan said that he was “in a state of shocked disbelief” and had been wrong in thinking that relying on banks to use their self-interest would be enough to protect shareholders and their equity. Still, many don’t see the emperor’s nakedness even now. Evelin gave this paper just months after the economy imploded, at the annual HumanDHS workshop on Humiliation and Violent Conflict at Columbia University in New York. Four years later, with so many people still hoping that things will return to some form of “back to normal,” it remains a very relevant piece of commentary. Evelin will be talking about her book, A Dignity Economy, at an open program offered as part of this year’s workshop, on Thursday, December 6, at 5:00-8:00 p.m (flyer here). 3. A new look for the blog — I gave the blog a quick facelift. WordPress.com offers a variety of themes for its blogs, and I found this one, titled “Elemin,” and thought it would provide a crisp and appealing new look. I hope you enjoy it. 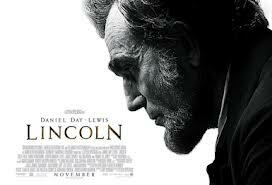 The movie “Lincoln” is getting so many kudos right now that I’m a little embarrassed to jump on the bandwagon. But I can’t help myself: This is a fascinating historical piece and a dramatic civics lesson built around America’s 16th President and the legislative battle to ratify the 13th Amendment abolishing slavery. Daniel Day-Lewis, directed by Steven Spielberg, provides us with what may be the definitive screen portrayal of Abraham Lincoln. Although media accounts tell us that Spielberg — not wanting the movie to be interpreted as an overt political statement — intentionally withheld release of the movie until after the election, it is hard not to watch Day-Lewis and to wonder how Mr. Lincoln would do as President today. Indeed, while “Lincoln” is a great film standing on its own, it also is a modern-day telegram to the current American President — and I’m sure that Barack Obama was always Spielberg’s desired recipient. President Obama is said to be enamored of Mr. Lincoln. However, during his first term, Mr. Obama all too often resembled George B. McClellan, the superbly organized but overly cautious Union general who frustrated Lincoln to no end and ran against him for President in 1864. The takeaways of “Lincoln” to the President? I can think of at least three: Fight smart and bold, seize the moment when it presents itself, and get your hands dirty with the grime of politics when necessary. Unlike our current chief executive, Mr. Lincoln had little formal education. And yet, beneath his outward folksiness, Lincoln was one of our most cerebral Presidents, having absorbed the likes of The Bible, Shakespeare, Euclid, and Blackstone’s Commentaries on the Laws of England. He blended with his intellect a feel for people and a willingness to throw himself into the bloody war of politics. President Obama has wowed many with his intellect, but he needs to do much more. He must translate that eloquence and intelligence into strong leadership. America and the world are still reeling from the economic downturn, the effects of climate change appear to be previewing even scarier things to come, and international armed conflicts abound. If the President needs a role model, he would do well to emulate his hero. It’s easy for me, a single guy with a decent income, to preach the evils of shopping at Walmart and other big box stores to folks who may be struggling to make ends meet, so I’ll pass on doing that. Rather, I’ll simply suggest that we support workers who are sticking out their necks to create better jobs for themselves and for others. This includes a thumbs up to Walmart workers who have been engaging in labor actions to protest their low pay and poor working conditions. Groups of Walmart workers are planning a Black Friday strike, the results of which also may signal the prospects of future union organizing at Walmart stores. I wish for them great success in sending their message. Watch the short video above and listen to the voices of Walmart workers asking to be compensated and treated fairly. For an assortment of Huffington Post blog pieces about the significance of the Walmart labor actions, go here. For a mainstream assessment of what the Black Friday strike means to Walmart workers, the company, and its customers, see this Washington Post piece by Renee Dudley, here. Monday, November 26 followup — The Black Friday labor protests fell well short of being a large scale walkout, but Daily Kos blogger Laura Clawson’s post summarizes actions taking place across the country. I’d like to share with you a disturbing, heartbreaking, and important new documentary, “Set for Life,” that tells the stories of Baby Boomers who have lost their jobs and who are trying to find work in the midst of our recessionary economy. The bottom line? For many workers, the American Dream is no more. The assumption that working hard and playing by the rules would lead to a relatively comfortable retirement has been demolished. It’s not just the bad economy that is doing a number on these workers. Not uncommonly, people in mid-life face age discrimination in their job searches. In the documentary, some of the laid-off workers express concerns about not getting a fair shake in the hiring process due to their respective ages. (In fact, I wish there would’ve been more expert commentary to put that topic into focus.) I’ve heard many similar stories in recent years. Furthermore, although “Set for Life” does not examine how older workers confront workplace bullying, I can attest that many people in their 40s, 50s, and 60s have been savagely bullied out of their jobs, with lasting consequences for their careers and financial well-being. Anecdotally, it appears that single women, especially single mothers, are especially vulnerable to being targeted. Despite its significance, the underlying narrative of “Set for Life” was largely neglected by just about everyone during the recent political campaign season. We heard the usual platitudes about making college more affordable for the young and preserving Social Security for seniors, but nothing examining the confluence of factors that has smacked around this demographic group so brutally. Maybe “Set for Life” resonates so strongly with me because it is largely about my generation — that group of late Boomers caught in this horrible recession during what should be their peak earning years. Their stories of hardship, desperation, and heartbreak are playing across the nation, and shame on us if we do not take them seriously and demand that America’s employers and policy makers do the same. “Set for Life” has been screened at independent film festivals and other programs, but if this subject interests you, I strongly recommend buying the DVD from the website at $19.99 including shipping and handling. For a short preview video, go here. “Set for Life” also has a Facebook page, here. For a review of “Set for Life” on the Next Avenue blog, here. Last week, Fulton County banned bullying in the workplace, making it a firable offense. The director of a workplace institute praises Commissioner Bill Edwards, who proposed the rules for addressing the harm bullying inflicts on victims and the work environment. While a criminal justice professor applauds anti-bullying policies intent, he says they aren’t an instant answer. And another professor suggests that Georgia adopt legislation geared to deter bullying. 2. Coming attraction: NWI handbook for MA workplace bullying targets — Early next year, the New Workplace Institute will release a short handbook for workplace bullying targets in Massachusetts, containing basic information on employee benefit programs and obtaining legal advice. Kimberly Webster, a Northeastern University law student who is interning with the Institute, is the lead researcher and author, with editing and drafting assistance from me. The handbook will provide information on workers’ compensation, unemployment insurance, Family and Medical Leave, Social Security disability, health care coverage, and legal options, as well as guidance on sorting through these possibilities. As the numerous disclaimers will make clear, the handbook will not substitute for obtaining legal advice, but it may lead people in the right direction for accessing available assistance. Also, because much of the relevant information is state-specific, the handbook will be of limited use to people in other states. The employee benefits and legal situation for bullying targets is far from ideal. However, we hope that this short handbook, which will be available for a nominal fee, will illuminate the options. We also hope that it will serve as an example for those in other states who wish to develop a similar project.